From February 25 to 27, a team from Asia Pacific Alliance for Disaster Management (APADM) visited Yangon, Myanmar and held talks with the representatives of CSOs active in disaster management as well as with local businesses. The objective of the meeting was to identify a way of bridging the two sectors. ?Myanmar NGOs formed the Myanmar Consortium for Disaster Risk Reduction (MCDRR) after Cyclone Nargis devastated the country in 2008. Since then, they have been working hand-in-hand with local communities to improve disaster preparedness for the future.? 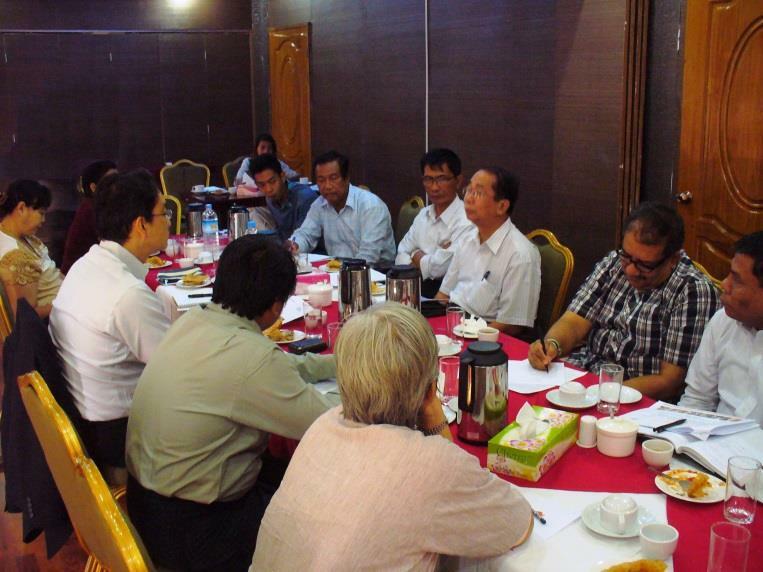 During this visit, the team met with Mr. Khin Maung Win, Chairperson of the consortium, and with other member NGOs, and discussed how they can proceed to bridge local NGOs and businesses for collaboration in disaster management in Myanmar.? All the members who attended welcomed the concept of regional alliance and expressed their strong interest in moving forward with APADM. The team also visited the headquarters of the Republic of The Union of Myanmar Federation of Commerce & Industry (UMFCCI) and discussed the concept of APADM with Mr. Zaw Min Win, Vice-President. The UMFCCI was a counterpart of three Japanese NGOs—Peace Winds Japan, JEN and NICCO—that responded in the aftermath of Cyclone Nargis with funds from the Government of Japan and donations from Japanese citizens collected through Japan Platform. As the chief executive of this joint programme at that time, Mr. Win has extensive knowledge on how to work effectively with civil society in post-disaster scenarios. He emphasized the crucial role the business sector should play in disaster management, and welcomed APADM’s initiatives in facilitating network building among different stakeholders in disaster management in Myanmar.? The team promised to continue the dialogue to realize this initiative.